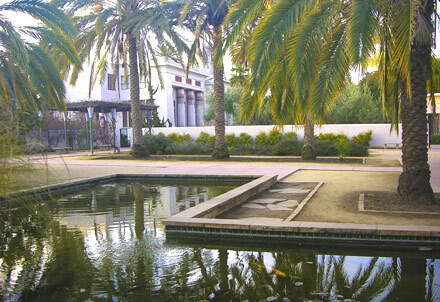 Rosicrucian Park hosts an Egyptian Museum, a Reseach Library, a Planetarium and a Peace Garden! This beautiful educational garden, authentic to the Eighteenth Dynasty of ancient Egypt, is based on examples of gardens from the remains of the city of Akhetaton, now called Amarna. The ancient Egyptians would relax in a garden like this next to their home—a garden full of medicinal plants and beautiful and fragrant flowers. "What you see before you is a manifestation of the love Rosicrucians feel for this place that we call Rosicrucian Park and the commitment we feel toward the ideals of Peace and Tolerance." All of the plants that appeared in their gardens had some use, be it as food or medicine. They carefully planted to take advantage of the beauty of each plant. A pool in the garden provided a cool spot for relaxation and contemplation, as well as habitat for fish and lotus plants. Small buildings in the garden provided places to honor ancestors and deities. Arbors filled with grapes decorated these gardens, as well as providing fruit and wine to the family. 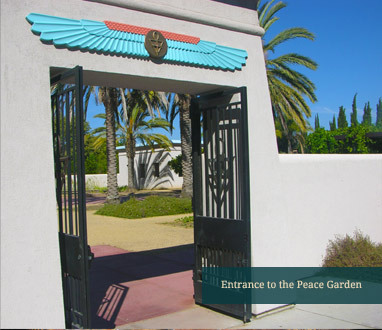 Thoughtful attention was given to every detail in the Rosicrucian Peace Garden, creating a truly educational and inspirational experience for guests at Rosicrucian Park. "Contribution to Peace" Find out more, what can you do to contribute to Peace? Rosicrucian Day of Peace: Rosicrucians and friends around the world celebrate the Rosicrucian Day of Peace on the fourth Sunday of June each year. Please join us on this day in the Rosicrucian Peace Garden. "I am not one who was born in the possession of knowledge; I am one who is fond of antiquity, and earnest in seeking it there." Help us create the first museum of its kind in the United States, and the largest Alchemy Museum in the world. Support the Rosicrucian Order's commitment to a sustainable use of natural resources.